Cruise deep-cut fjords along the fabled Norwegian coast. Sail across the Arctic Circle where the midnight sun shines 24 hours a day. 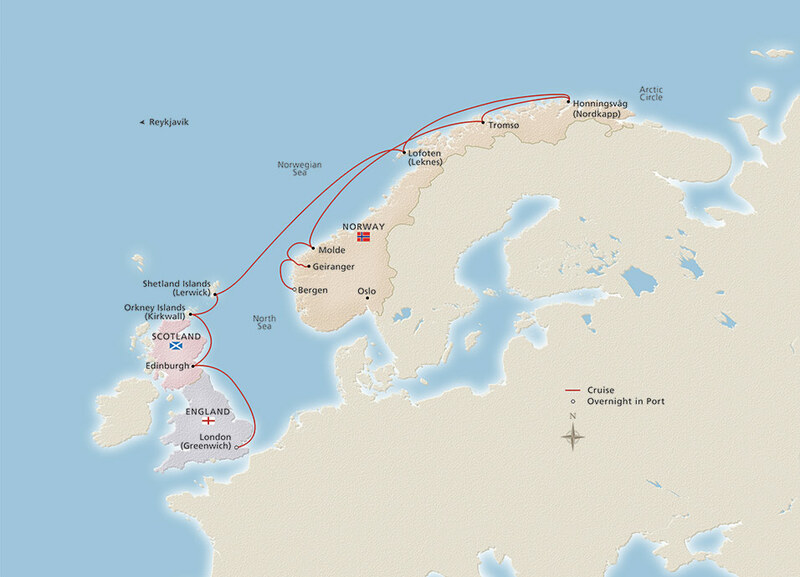 Then follow the path of Vikings from the remote beauty of North Cape to the windswept Shetland and Orkney Islands of Scotland. Enjoy an overnight stay in the former Hanseatic League city of Bergen and visit the Scottish capital Edinburgh, where medieval glory mingles with classic beauty. Take in more of Bergen’s Norwegian charms today. In the city’s Old Town, explore narrow cobblestone lanes and peer into shop windows. You’ll find this Hanseatic haven to be a walker’s delight. You might also spend time on the ship today, perhaps indulging in a treatment at The Spa or settling in with a good book in the Explorers’ Lounge. Cruise into the tiny village of Geiranger via the Geirangerfjord, one of Norway’s most spectacular fjords. If you would like magnificent bird’s-eye views of this magical setting, join an included tour to Eagle’s Bend, perched 2,000 feet above the village. It is a thrilling drive marked by 11 hairpin turns and incredible panoramas. Immerse yourself in the great outdoors on an optional tour to witness spectacular waterfalls or journey through the fjords by kayak. Take time to explore Molde today, a city that charms with its natural beauty. Known as the “City of Roses” for its well-tended flower gardens, Molde is surrounded by over 200 partially snowcapped mountains. You may choose to visit the fascinating open air Romsdal Museum, which offers 40 examples of old Norwegian architecture, from log houses to a small chapel. Today you cruise the magnificent Inside Passage; its waters are glass smooth and there is spectacular scenery all around. Your ship’s small size allows navigation of this pristine region of coastal Norway. You can also take advantage of onboard amenities: an enrichment lecture and Nordic-inspired treatments at The Spa. Tonight, cruise under the tranquil light of the midnight sun. Enjoy the lovely setting of Tromsø’s historic center, spread over a scenic island. On an included tour, admire its blend of wooden structures and neoclassical buildings. You’ll visit the stunning Arctic Cathedral with its striking triangular shape, the city’s most recognizable symbol. You might also learn about arctic exploration and dogsledding. Meet the owners and residents of the Tromsø Wilderness Center and hear about their exciting expeditions. Pay a rare visit to the remote port of Honningsvåg. From this tiny outpost town on the island of Magerøya, journey to the top of North Cape, or Nordkapp, on an included tour. This dramatic rocky plateau looks over the Barents Sea from a height of 1,000 feet. Alternately, set out on a wildlife expedition to the Gjesvaerstappan Nature Reserve, or spend time with the local Sami people and enjoy a warm welcome. Experience the distinctive beauty of the Lofoten Islands today, where the sculpting power of nature comes into sharp focus. Soaring, jagged peaks overlook sheltered bays in this remarkable archipelago of six main islands. Traditional rorbus, charming fishing cottages, seem to hover over the waters on stilts, and the streets of its capital, Svolvær, are stunning and scenic, a delight to explore. As you cruise to our next port, spend the day savoring the amenities of your elegant ship. Indulge in Nordic-inspired treatments at The Spa or find your inner calm with some yoga on the Sports Deck. Tonight, dine on thoughtfully prepared cuisine that connects you to the flavors of Scandinavia and watch a movie beneath the stars at the Main Pool. Admire the rugged beauty of one of Scotland’s remote island outposts today. Set out to explore the island and meet its famous residents—Shetland ponies. Perhaps visit the remarkable archaeological site of Jarlshof—evidence of a thriving Viking presence. Or, sail the seas on board a replica Viking longship and try your hand at rowing for a true Viking travel experience. Today, immerse yourself in the rich history of the Orkney Islands, ruled by the Vikings from the 9th to 13th century. See the Standing Stones of Stenness, a 5,000-year-old circle of stones, and explore this ancient monument. Visit the well-preserved Stone Age settlement of Skara Brae, or for a true taste of Scotland, take a trip to the world’s most northerly whisky distillery. Today, you’ll take in the medieval and neoclassical beauty of Scotland’s capital, gracefully set among rocky hills and gracious green ribbons of park. On an included tour, browse the Royal Mile—the famed avenue connecting the hilltop Edinburgh Castle and the Palace of Holyroodhouse. You might elect to explore Edinburgh Castle more closely, including a visit to the Crown Jewels. Or, venture to medieval St. Andrews, birthplace of golf. Enjoy another day on board as you cruise the North Sea. Attend an illuminating enrichment lecture on board. Take in the sea views from the Explorers’ Lounge. Tonight, dine at your choice of venues, perhaps pairing sommelier-selected wines with a carefully prepared tasting menu at The Chef’s Table. Discover the celebrated Royal Borough of Greenwich—part of which, Maritime Greenwich, is a UNESCO World Heritage Site. London is just a short drive away, so you can take in the regal city and all its splendor. See the Tower of London, Parliament and Big Ben, Westminster Abbey, Buckingham Palace and St. Paul’s Cathedral. Or venture into the countryside to visit Windsor Castle, one of the royal residences. Alternately, step off the ship to tour Greenwich, its excellent National Maritime Museum and the Royal Observatory from where the world’s clocks are set. Disembark your ship this morning as your journey comes to a close, or extend your stay in London. Alternatively, you may continue your journey with an extension opportunity in Scotland.